Hi beauties. I hope you are all great. Today I thought I would introduce you to something I have been working on for quite some time. A while ago I started making jewellery and realised I love it so much I decided to make a store titled shopcherryfashion which went with my blog name Cherryfashion. After the blog name change, I had a lot going on and decided to close the shop until I was sure I am able to take orders. While writing my thesis, I decided I wanted the store to have it's own name and social media. So I decided to do some rebranding. And that's how Vanilla Shimmer was founded. 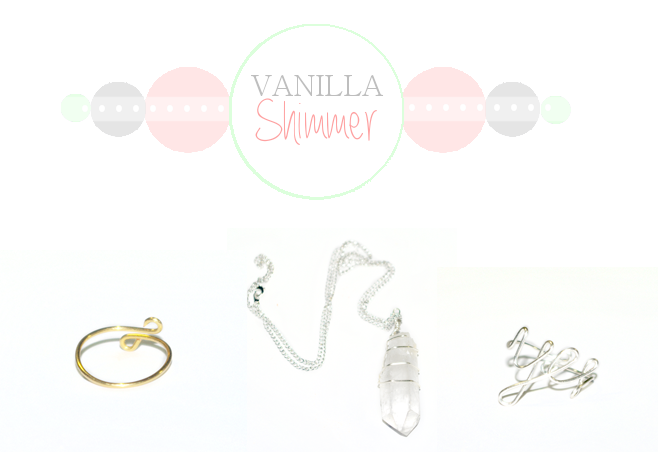 Vanilla Shimmer is a store for handmade items such as jewellery, hair accessories and dog bows. There will be new items constantly being added to the shop so keep an eye out. Some of the items are only available in a single copy and as such are very unique. The new collection is now available and all items are plated with either gold or sterling silver which makes them of great quality. Be sure to stop by the shop and follow Vanilla Shimmer on Twitter & Instagram. I hope you like the items available. If you would like to make a custom order, just get in touch.